Do you love a feeling of rustic cosiness? These wallcoverings simply exude nostalgic charm. Wood-panelled walls, painted tiles and bricks all feature large here. The various collections showcase these materials and interpret them in a contemporary way. Add some fresh accents to your own four walls with country-house style colours like wool white and dark blue. Punchy red and blue stripes and dots transform your walls into truly eye-catching features. Alternatively, immerse yourself in a world of natural colours and fresh pastel shades to suit your own taste. Live every day like it’s Sunday: top-quality fleece wallcoverings create a romantic atmosphere. Classic ornamentation imbues your walls with sophistication, without a hint of fussiness. Now you can enjoy the sight of wildlife traversing your very own walls, or create your very own enchanted garden at home. You’re bound to look forward to Sundays even more with the tasteful motifs from this collection. Bring a breath of fresh air to your home with the mellow, springlike colours of the Lucera collection. Dress your walls to perfection with gorgeous flowers and breezy foliage. You’ll feel as though you’ve taken a walk on a spring day. The b.b home passion VI collection takes you on a journey to southern Germany, conjuring up fairytale forests and sparkling streams for your very own four walls. Succumb to the charm of this quaint and romantic scene, with half-timbered houses and wooden shingles. Floral patterns and harmonious colours create a playful, easygoing atmosphere. 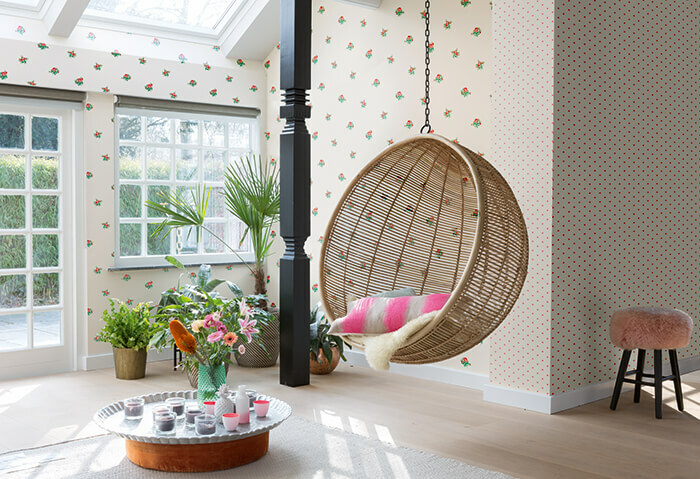 These restrained prints lend your space a cosy atmosphere and homely charm with an utterly natural feel. Create sophisticated accents with these delicate, detailed motifs, or decorate whole rooms for an on-trend country-house effect.